When you remove a shrub from your yard or garden, you must do more than just cut back its foliage. Some species of shrub can actually regenerate if their roots are left in the ground. And if you wish to re-plant the area, you will need to get the roots out of the way first. Shrub root removal is a fairly straightforward process, but it does require a fair bit of physical labor. Cut back the shrub's foliage to a manageable size. 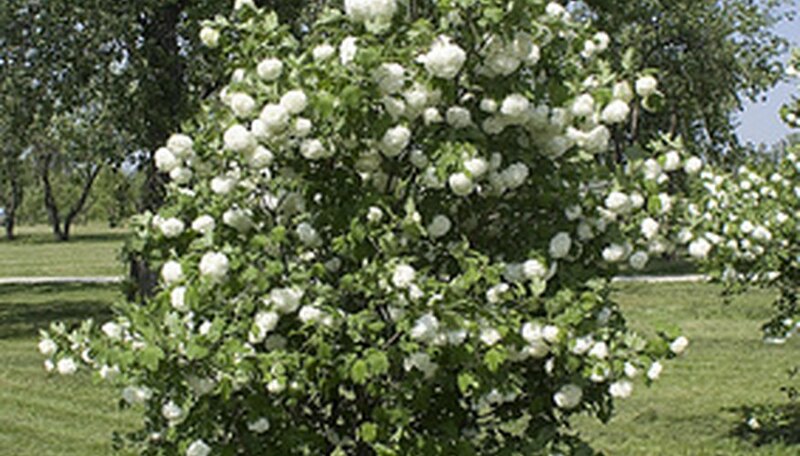 Remove the outermost branches of the shrub, but leave the central branches and cut them down to 4 feet in height. They can be used as a lever to help you remove the roots. Loosen the soil. Lay a hose at the base of the shrub. Turn the water on low and allow it to run for a few hours to make sure the soil is moist below the bottom of the roots. Dig a trench that is slightly wider than the roots of the shrub and 2 to 3 feet deep. If you cannot dig that wide because of other plants or structures, simply dig as wide as you can. As long as most of the shrub's roots are removed it will not grow back. Undercut the root ball. Place a shovel or marttock in the bottom of the trench and wedge as deep underneath the roots as you can. Repeat this all around the root ball. Loosen the roots from the soil. Grab the shrub's branches and rock the plant back and forth until it is freed from the soil. If there are no branches left, push against the root ball with the shovel until it is freed. If the root ball cannot be easily pushed, undercut the root ball further. Wear sturdy or steel-toe boots when working with a mattock.